A novel treatment for pulmonary fibrosis has been identified, according to a study published in the Journal of Pathology. Researchers from The Saban Research Institute of Children’s Hospital Los Angeles (CHLA) as well as investigators from China, Mexico, and Canada noted that idiopathic pulmonary fibrosis (IPF) appears spontaneously with no specific cause, and is signaled by excessive growth of factor TGF-β. The increased expression of TGF-β in IPF patients and experimental models of IPF is has been widely documented as well. TGF-β is essential to other systems like immune response in addition to its pro fibrotic effect, the researchers said. When TGF-β is blocked, the researchers said, the situation is not ideal. 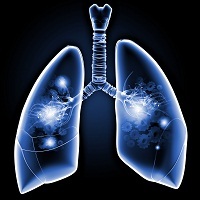 TGF-β signaling was manipulated by the researchers in adult lung mesenchymal cells during selected stages of lung fibrosis using a unique transgenic mouse model. The model was developed by the researchers from The Saban Research Institute, and they were able to demonstrate that the progression of fibrosis mediated by TGF-β was independent of early inflammation. This process, beginning at the early stages of fibrosis, aided the vital understanding to designing therapeutic strategies to stop the progression in IPF patients. The researchers secondly demonstrated that an over produced downstream gene called P4HA3 was important to a collagen deposition associated with IPF. They wrote that the gene encodes a component of prolyl 4 hydroxylase, an important enzyme in collagen synthesis. Inhibiting the development of P4HA3 slowed the TGF-β stimulated collagen production in cultured fibroblasts – the connective tissue cells that produce collagen – as well as mouse models of lung fibrosis.